Sydney - Australian top order batsman Rob Quiney is desperate to get another taste of test cricket and will be ready to go if Shane Watson is unfit for next week's second match against South Africa. Quiney made his test debut in last week's drawn first test in Brisbane and is on standby to replace Watson again if the all rounder fails to recover from a calf injury. The 30-year-old Quiney made just nine runs batting at number three at the Gabba before being caught out on the boundary by a brilliant Dale Steyn catch. Coach Mickey Arthur joked that it was the "best nine" he had seen and that Quiney had not looked out of place in test cricket, but the batsman himself was naturally disappointed with his effort. "I'd rather make a scratchy fifty than a 'good nine'," he told reporters in Adelaide, laughing. "I'm a batter, my job is to make runs and I didn't make runs," he added. "Cricket is a funny game - it can turn around pretty quickly. "I have only had one innings in test match cricket so, if I get another couple of innings, hopefully I can turn that around and score some runs for the side and, more importantly, help out to contribute to a win as well." 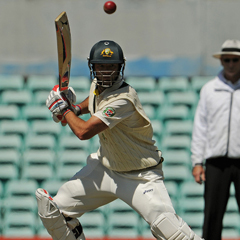 Despite Quiney's disappointment, Australia finished the first test on a high after forcing the tourists to bat through most of the final day to save a draw. The return of 35-test veteran Watson would undoubtedly strengthen their top order, in experience if nothing else, but only if he passes a fitness test early next week. "It's going to be beneficial to the team if he can bat and bowl, it's such an important series, especially with the first match ending in a draw," Quiney said. "But if he doesn't get up or is still unfit, I feel like the last test was a bit of a dream and I have got a job to do now. "If I do get the chance, obviously I have to knuckle down and get some runs." The second test at the Adelaide Oval begins on Thursday and the series concludes at the WACA in Perth from Nov. 30-Dec. 4.